Black powder is a chemical mixture invented in the 9th century and was practically the only known propellant and explosive until the middle of the 19th century. As such it has been superseded by more efficient explosives such as smokeless powders and TNT. It is still manufactured today although primarly used in fireworks, model rocket engines, and in reproductions of muzzleloading weapons. Black powder is commonly referred to as being the backbone of all fireworks, a statement which indeed comes near to the truth. The optimum proportions for black powder are: 74.64% Potassium nitrate, 13.51% charcoal, and 11.85% sulfur by weight. The current standard for black powder manufactured by pyrotechnicians today is 75% potassium nitrate, 15% charcoal and 10% sulfur by weight. Generally commercial manufacturers (such as GOEX) make use of large and heavy wheel mills to integrate the components as well as possible. While such machinery is beyond the means of most amateur pyros, comparable products can be made at home. The most common methods of small scale black powder manufacture are treated and compared here: Black Powder Manufacture. The performance of black powder is contingent on many factors, the two most important being method of manufacture (intimacy of integration) and derivation of charcoal (type of wood, carbonisation process). Black powder is used "corned" (granulated) when it is expected to provide a high amount of force in a short period of time e.g. for propelling or breaking shells etc. The intimately mixed powder (meal powder) is granulated either via dampening and rubbing through a coarse screen ("ricing") or via dampening, pressing to a known density (usually about 1,7g/ccm) and crushing the resulting "cakes" ("corning"). 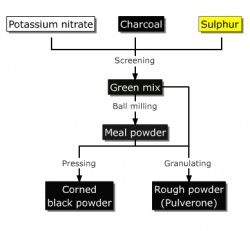 Commercial grain gunpowder is granulated using the latter method. The resulting material is separated by size using screens. The products of burning do not follow any simple equation. One study showed it produced: 55.91% solid products-- Potassium carbonate, Potassium sulfate, Potassium sulfide, Sulfur, Potassium nitrate, Potassium thiocyanate, Carbon, Ammonium carbonate--and 42.98% gaseous products--Carbon dioxide, Nitrogen, Carbon monoxide, Hydrogen sulfide, Hydrogen, Methane, Water. Black powder is classified as a low explosive, that is, it deflagrates (burns) rapidly. High explosives detonate at a rate approximately 10 times faster than the burning of black powder. Although black powder is not a high explosive, the United States Department of Transportation classifies it as a "Class A High Explosive" for shipment because it is so easily ignited. Highly destructive explosions at fireworks manufacturing plants are rather common events, especially in Asia. Complete manufactured devices containing black powder are usually classified as "Class C Firework", "Class C Model Rocket Engine", etc. for shipment because they are harder to ignite than the loose powder.